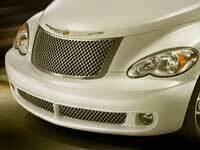 Great looking two piece chromed ABS set for the lower grille on the new 2006-2010 PT Cruisers. Clip-on installation, simply fits over existing grilles. This stunning new three piece grille set for the 2006-2010 PT Cruiser is made from chrome plated stainless steel and is manufactured to a very high standard. The top grille simply replaces the existing grille and the two lower mesh grilles fit over the existing ones and are held in place by the supplied screws. Full instructions included. 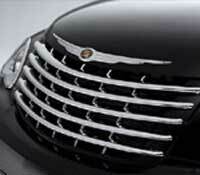 Fits PT Cruisers 2006-2010 including convertibles. The style and the rear of the PT lends itself perfectly for this popular ABS accessory. It brings back the look of past times when many cars had a Continental wheel kit fitted. The centre plate and wheel trim are of polished stainless steel. It comes with full instructions and all the required fittings. The easy installation requires drilling six small holes to fit. Ready for painting. Fits 2000 - 2010. Note: This kit is for show only and does not hold a spare wheel.